Following the interruption of my doctoral studies in synthetic organic chemistry by the Viet Nam conflict, I took a job at Rocket Research Corporation to develop puncture sealants for automobile tires in the mid 1970’s. The polymer chemistry work led to my being promoted to project manager of a large energy survey of all industry in the states of Washington, Oregon, and Idaho. In working for the governors of these three states in developing alternative energy resources through waste heat recovery and cogeneration of electricity, a whole new way of looking at our world had begun. We were no longer living in a world of abundant resources so now we needed to start utilizing our by-products, including waste energy. Several new projects resulted from these energy surveys. The project that has defined my life began in 1980. It was in the production of chitin, chitosan, and glucosamine from waste crab and shrimp shells. It began by meeting Lee Johnson, who had developed several patents in the field of chitin and chitosan, and who later became my partner, mentor and friend. The challenge was to raise the capital to build a manufacturing plant in the United States, which we did. The next challenge was to build markets for this interesting polymer, which turned out to be much more difficult than we ever could have imagined. We had original patents on the use of chitosan as a flocculent in water treatment. However, it was not for another 30 years from the issue of the original patent that the market for this application actually developed. In an effort to raise funding and market presence we sold our company to a Norwegian business. When they lost interest we started a new company called Vanson which we sold to Dupont/ConAgra. When Dupont/ConAgra lost interest, we bought Vanson back in 1995 and finally started to make money. In an attempt to vertically integrate the company, we purchased East Point Seafoods in 1997. We still lacked the necessary capital to grow the business and so brought in outside investors in the late 90’s to support the growth. But in 2000, I was forced to sell my interest in Vanson due to health issues, but kept the East Point Seafoods business and plant. During these development years, we introduced a chitosan based clarifier for the pool and spa market, wound healing bandages for the 3M company, wine clarification kits for England, odor free sponges for 3M, a trademarked dietary supplement ingredient called Liposan, a pulp and paper wet strength additive, a phosphate remover for the pool and spa business, a flocculent for the water treatment industry, and developed seed coatings and foliar sprays for agriculture. We also built processing plants in several countries for the manufacture of chitosan. We had produced an interesting polymer, but finding commercial applications has taken many years and lots of investment. In 2006, as Dungeness Development Associates Inc. we introduced ChitoVan to the construction stormwater treatment industry in the state of Washington. The product was in such demand that we accepted an offer to sell this part of our business to Clear Water Compliance Services in 2007. But with the downturn in the economy, Dungeness Development repurchased the business in 2009 and renamed it Dungeness Environmental. Currently we are developing new innovative technologies to solve water quality problems across the globe. Stay in touch for coming developments for trace metals removal. I have been married to my wife Diane for 43 years, we have 3 grown sons and have lived in Kirkland, Washington since 1973. I have restored over 30 diesel Mercedes in the past 10 years for use by people who have limited budgets. I also restored a 1953 45 ft Chris Craft which is shown regularly through the Classic Yacht Association. 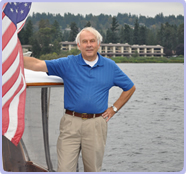 In addition, I am a cofounder of the Agros Foundation which has developed land and villages in Central America for the very poor, have served on the Bellevue Christian School Board for 9 years, have been President of the Board of Alta Vista College and am currently Vice President of Council for the Seattle First Christian Reformed Church. I believe that life is all about relationships and caring for one another, in community. This has been an exciting adventure and it just continues to get better.